First and foremost I must admit I was shocked when I saw the trailer for Solo premiere during the 2018 Super Bowl. Up until that moment, I had genuinely believed the next foray into the Star Wars canon would star Lando. As one of the few black people in Star Wars and the suavest of them all, interest for a film focused on Lando has always been bubbling beneath the blerd surface. Thanks to the critical success of Atlanta, Donald Glover has been accumulating hundreds of admirers full of effusive praise and had been cast as a young Lando in the hearts of many for years. My jaw dropped when I realized this film would be all about Han. Despite starting with a chase, the first half hour of Solo plods along with jokes and quips falling flat. The first impression was that perhaps this was a film made more for children than adults. The pace picks up once Han and Chewie (Joonas Suotamo) (Alden Ehrenreich) intertwine their future and fortunes with that of Beckett (Woody Harrelson), Val (Thandie Newton), and Rio (Jon Favreau); a trio of bandit smugglers working on a big score for crime lord Dryden Vos (Paul Bettany). When things predictably go wrong, the remaining crew do their best to make it up to Vos. Bettany as Dryden Vos is engaging and intense as a villain but is given far too little do. Newton’s talent and charisma, along with my hope of a Black woman playing a significant part in the series is thoroughly betrayed. Glover as Lando is just as suave as ever, although at times his performance feels more like a Billy Dee Williams impersonation. L-3 (Phoebe Waller-Bridge), Lando’s droid companion is charming, witty, and woke bot #1 with a sincerity concerning equity for droids. Ehrenreich’s Han is the Achilles’ heel of the cast. His character is made of quips, flight skills, and not much else. His parentless past doesn’t seem to affect him. He is only ever full of self-confidence. Teflon to hardships there’s nothing for the audience to hold on to or sympathize with. He’s an amalgamation of teenage boy’s most fervent wishes of cool instead of rich and developed character deserving that is deserving of an entire film. New friends are found, alliances made, rejoicing in reunions, a robot revolution, hearts are broken, and several backs are stabbed before it’s all over. 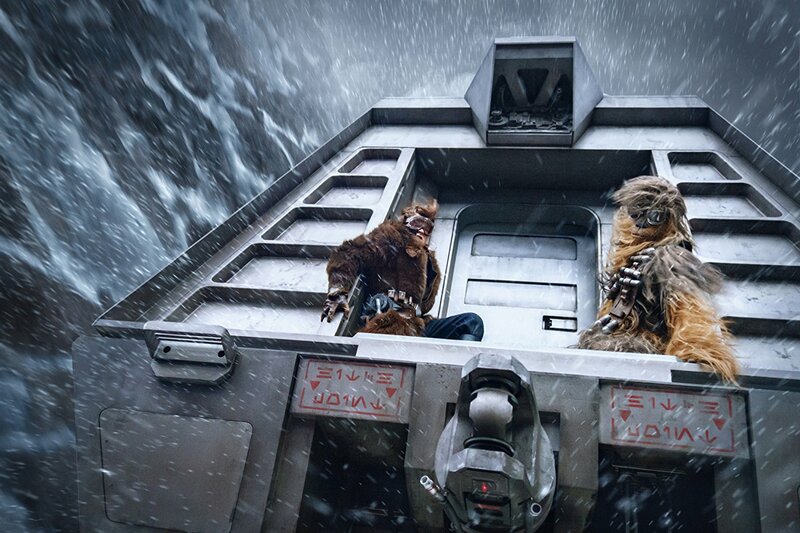 Despite dragging in many places over two and a half hours, Solo does have a few rewarding scenes that keep the viewer engaged and even surprised. Fervent Star Wars fans are going to love Solo, but a more casual fan is better off waiting for a streaming option. Wait. Solo hits theaters this Friday, May 25th. Purchase your tickets now at Fandango, so you don’t get sold out. Have you seen Solo? Share your thoughts on the film in the comment section below! We’ll still see it in the theater, but probably at a weekday matinee after my brain recovers from Deadpool 2. Never was into Star Wars but I will watch to see what the hype is about. I haven’t seen any Star War’s movies and will continue to not watch them. Thanks for the synopsis. Will see Saturday. Until then squinting eyes from spoilers. I’m not really into Star Wars and didn’t have very high expectations. It was ok.
Straight money grab! If any highlights was The woke droid and a surprise appearance. As a big Star Wars fan I was let down. But hey that’s just me. Was never able to get into Star Wars movies so will take your advice and wait. Appreciate your honesty because don’t want to waste my time. I enjoyed Solo even though I was not familiar with and of the Star wars movies made in the late 90s and 2000s. I do feel like I might need a refresher. Thank you for your review. Not that excited to see it but I’m probably catch it with friends sometime soon. I extremely disagree with this review. In my opinion, this was by far better than “Force Awakens” (which was basically “New Hope”, just with the roles switched around). This movie is, at least as good a Rogue One (if you liked Rogue One, cant see why you would not like this….). I would definitely say PAY. No Darth Vader? no light saber (almost)? Please. I consider myself a fan, since I saw all Star Wars movies. I was disappointed by this movie. While it had some good things and some new things, the good things were not new, and the new things were not exactly good. There were, not necessarily in this order: 1. one Han Solo actor who tried desperately to look like Harrison Ford’s Solo – and the paradoxical thing was that he was close, but by being close he reminded us that he just resembled Harrison Ford, was not him; 2. a totally confusing love story between Lando and a she-robot who militates for robots’ rights (?!? really ?!) 3. what exactly was that fuel/substance that they search during the entire movie?! why was it that important? never heard of it 4. a Becket who was played by an actor that I unfortunately saw in major productions, such as Natural Born Killers and countless others, far more superior and far more “noir” than this predictable back-stabber; 5. a Qi’ra that we all know from Games of Thrones – against, her part was too minimal for such a talented actress. What was her story again? Please, I don’t want to see her again. 6. what to make with the hidden villain from prequel no. 1 (won’t say his name) ?! wasn’t he supposed to be dead? does this mean we can anticipate Snoke’s comeback in Episode 9, as he died more or less the same way?! another thing that I found depressing was that everything was doubled in the movie, you had the same things twice, same story, same plot, even the minor plots (such as the sabbac game). did I forgot someone? well, at least Chewie was a convincing chess player, they got it right. yeah, and the familiar feeling of deja vu for the big ending, taken from the Da Vinci Code (same director). This was not a Star Wars movie, it was a Western movie (train robbery, lots of shooting, traps all over the place, even gambling) with some Star Wars characters. Worst Star Wars Movie, except prequels no. 1 and 2. In comparison, Rogue One was a masterpiece, at least they kill them all. I haven’t seen this movie yet but I hope I enjoy it. Thanks for the great review! I had missed the last one or two Star Wars movies, but I’m glad I was able to catch this screening. I definitely enjoyed it and the storyline. It also brought the humor here and there. Would recommend to others.